The Swedish work wear producer, Blaklader, design their work wear around industry and for professions in onerous environments. Each garment has been ergonomically designed to incorporate functionality and comfort, including features such as appropriately sized pockets to hold modern tools and knee protection pockets in two heights. The materials used to construct Blaklader work wear are varied according to the appropriate use of the garment. For example, Cardura® is an extremely durable and wear resistant material, used on Blaklader work wear that is constantly subjected to harsh working environments. For the first time, Blaklader have produced a work wear range suitable for the forestry and garden industry. Key features if the forestry and garden range are; the pockets are designed to hold tools such as pruning shears, a pen and a pad. 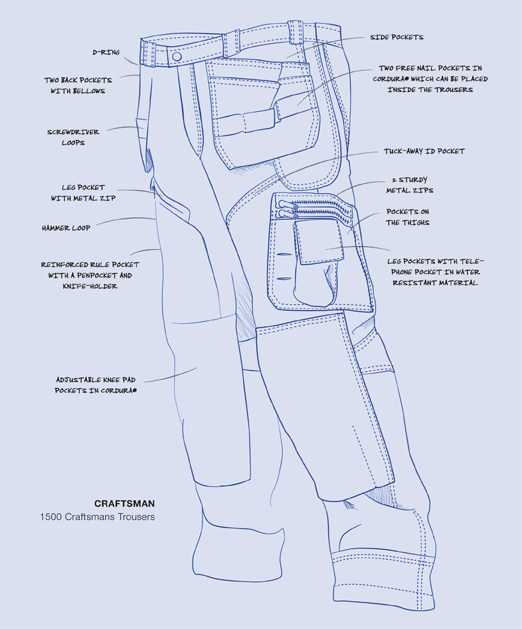 There is also no side seam at the bottom of the trousers, to ensure a comfortable fit when tucked into boots. Trousers are trousers aren’t they? A seam is a seam? Not when considering Blaklader work wear. Every detail is designed and manufactured and tested with the greatest possible care to ensure that work clothes really work and can take a beating. For example, the Craftsman Trousers have triple-needle stitching in heavy-wear places, sewn on special machines in Blaklader’s own factories. Each pair of work wear trousers takes almost a kilometer of thread. The result is a garment so durable that Blaklader offer a life-time guarantee on the seams. Blaklader is also the only work wear clothes manufacturer that offers a lifetime warranty on its seams. If a seam splits, as long as it has not been torn by sharp edges or tools or worn away, Blaklader will repair it or replace the garment.